Peg Rogers, wife of District Governor Bob Rogers, will join us on April 25th to speak about a topic very dear to her heart. With a Masters Degrees in Education and in Psychology, Peg’s professional career includes working with distressed youth, promoting educational programs that empower youth and giving them the tools for success, starting with peaceful relationship skills and positive self-awareness. Her Rotary career started less than 2 years ago after hearing a woman’s Domestic Violence survival story at the Rotary International Convention in Seoul, Korea. She returned home to Sebastopol, joined Rotary and immediately formed a two club Domestic Violence/Family Safety committee to begin making a difference in our community. Second: Peace and Conflict resolution, developing positive relationship skills and peaceful methods for problem solving, alternatives to violence in the home and at school. Like and follow our District DV Facebook page for more information and education www.facebook.com/D5130familysafety. 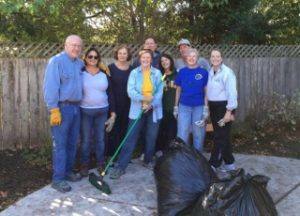 Peg is in the yellow shirt with a group of Rotarians from Santa Rosa Clubs and Sebastopol Clubs helping with clean up after the fires at the YWCA therapeutic preschool for at risk kids, near Coffey Park.